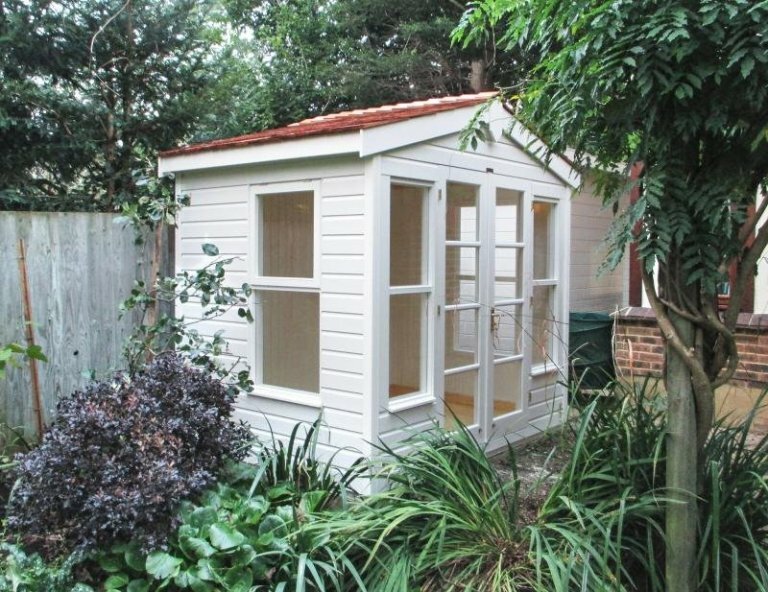 This 2.4 x 1.8m chalet-style building is our Blakeney Summerhouse, and it has been installed in our customer’s garden in Knaphill, Surrey to use as a pretty writing room, away from the hustle and bustle of their house. The customer’s garden is sheltered, with several trees surrounding it, so for this reason, they asked if we could remove the standard roof overhang of the Blakeney to allow more light into their summerhouse. We were happy to do this, especially since it means that the customer will get more enjoyment out of their new building. 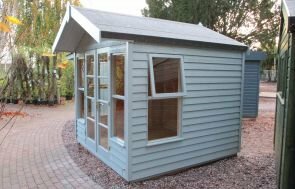 To help brighten up their garden with the summerhouse, the customer chose to have cedar shingle tiles on the roof, and the building has been painted in the colour Cream from our Valtti Paint Range. This light, bright feel has been carried on inside the Blakeney, as it has matchboard lining that has also been painted in this light, neutral colour. As well as the matchboard lining, the customer also chose to have full insulation inside the summerhouse to make it comfortable to use through the year, as well as having a Natural lacquer on the floor to give it a protective and attractive sheen finish. 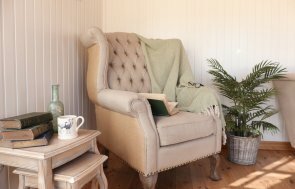 For more information on our range of Summerhouses, you can create your own by using our Online Garden Building Planner Tool. If you have any queries for your team, or you can Contact Us, Request a Callback, call us on 01760 444229 to speak to our helpful team. Alternatively, please come and visit our Sunningdale Show Centre to see our extensive range of timber garden buildings for yourself.